From the discovery of the structure of DNA makes people have a preliminary understanding of gene structure, to the emergence of PCR technology to achieve gene amplification in vitro, and then to the PCR based gene sequencing technology. The first time we have seen the whole information of human genome library. But no matter how the genetic manipulation technique develops, it can not change people's fanatical pursuit of gene editing technology, and that because it’s directly related to human diseases of diagnosis and treatment, bear and rear better children and the evolution of race. Gene editing technology has gone through 3 stages of development. The first and second generation techniques were represented by Zinc-finger nuclease(ZFN) and transcription activator-like effector nuclease (TALEN). The third generation technology was represented by CRISPR/Cas9, which derived from an acquired immune system of bacteria. Compared to the other two generation technologies, CRISPR/Cas9 technology has the advantages of low cost, simple operation, fast and high efficiency, then it was quickly popular around the world. In recent years, more than 10000 high-level articles have been published by using CRISPR/Cas9 technology, which was considered to be the only gene editing technique that has been validated for clinical treatment currently, it is also called "gene super scissors". Cloud-Clone has been devoted to the develop and research of gene editing techniques, there are CRISPR/Cas9 technology platform and the supporting technology platform of lentivirus and adenovirus transfection platform technical system. 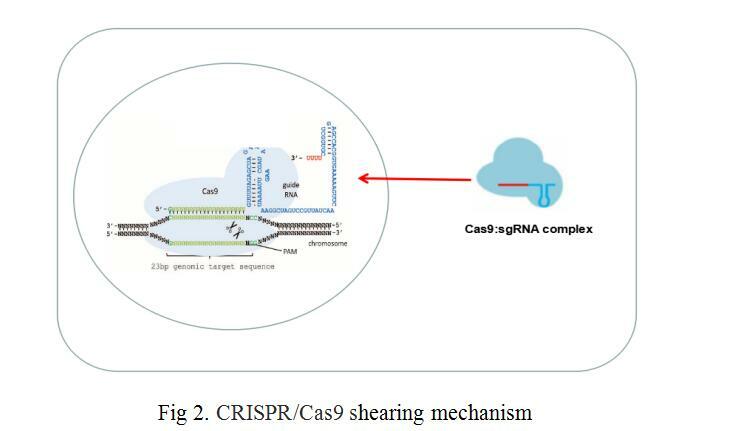 The CRISPR/Cas9 gene editing vector contains Cas9 expression element, sgRNA transcription element, screening marker element, prokaryotic replication element, etc, resulting in too large transfection plasmid. The transfection efficiency and stability would not be high and well by using the traditional transient transfection technique, and it’s difficult to achieve the desired objectives, but the lentivirus and adenovirus transfection system can solve the problems well. Virus strains in lentivirus and adenovirus transfection systems were transformed from viruses infecting mammalian cells, so they can become a good genetic vector. The screening and enriching recombinant virus can be directly used to infect target cells. In the process of infection, the CRISPR/Cas9 enters into the target cell as the recombinant viral genome (as shown in Fig 1). Through this infection process, on the one hand, the transfection efficiency of target fragments to target cells was guaranteed, on the other hand, efficient expression and transcription of Cas9 and sgRNA were achieved by means of the expression of the virus, so as to ensure efficient shearing of the target cell genome in specific positioning point (as shown in Fig 2). We combined lentiviral transfection with CRISPR/Cas9 techniques, fixed point editing the BECN1 gene in MCF-7 cells. First, we selected three CRISPR/Cas9 sequences (N20NGG) of 23 bases in the two exon regions of the human BECN1 gene (as shown in Fig 3), guide sequences of 20nt and their complementary sequences were obtained by chemical synthesis. SgRNA and its complementary sequence were annealed to double chains, LentiCRISPRv2 recombinant vectors containing sgRNA sequence information were constructed by means of BsmBI single enzyme digestion and enzyme binding (as shown in Fig 4). 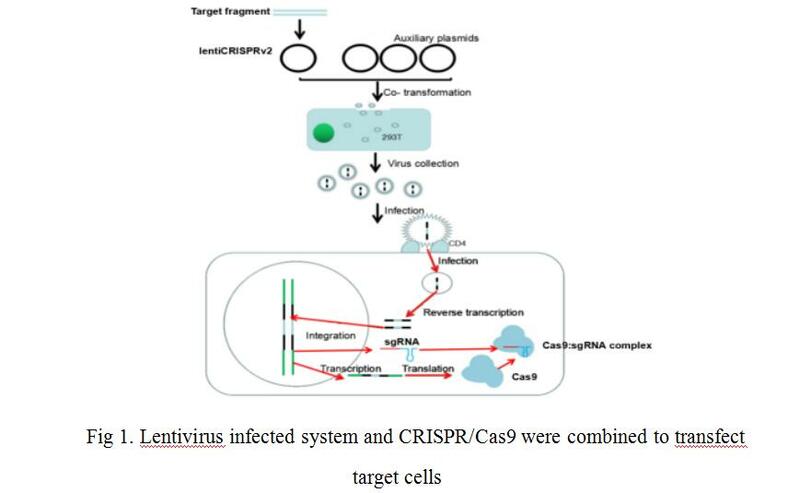 LentiCRISPRv2 recombinant vector contained all of the CRISPR/Cas9 components and the core components of the lentivirus, and then it was transfected into 293T cells together with lentivirus packaging plasmid. In co-transfected 293T cells, lentivirus were self packaged to form infectious viral particles, which also contained all the components of CRISPR/Cas9. After infecting MCF-7 cells, the recombinant virus genome was inserted into the MCF-7 cell genome, through screening by puromycin. Finally, stably transfected MCF-7 cells were obtained. In stably transfected MCF-7 cells, Cas9 and sgRNA can express stably and transcribed, further, the shear complex was synthesized. The complexe was translocated into nucleus to complete the shearing of sgRNA’s complementary DNA fragments, and finally the directional shearing of target fragments were achieved (as shown in Fig 5). For the gene knock out performance at the protein level, we made further validation through WB, the content of BECN1 protein was semi-quantitatively detected by WB technique with screened cells. 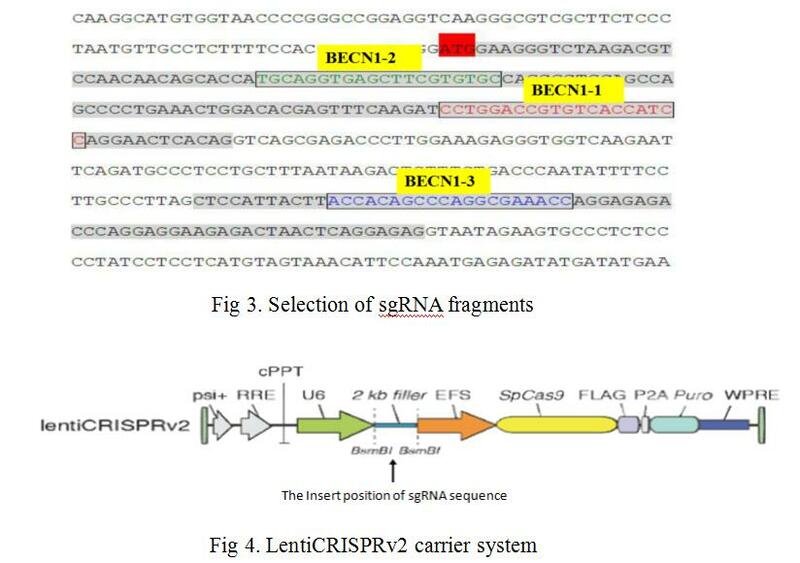 The test result was shown in Fig 6, the three selected sgRNA had been re-edited the production of the BECN1 gene in MCF-7 cells, by artificially creating frameshift mutations, the content of BECN1 protein was significantly reduced. CRISPR/Cas9 technology has been widely applied in gene knockout and knockin cell lines and animal preparation, it has a wide range of practical value in the study of gene function, disease treatment, species transformation and other fields. Cloud-Clone has been dedicated to the application of CRISPR/Cas9 technology in cell lines and animals. With the development of CRISPR/Cas9 technology, we can provide more efficient service of gene knockout and knockin cell lines and animal models.